Welcome to this month's installment of the Secret Recipe Club! My assigned blog is The More Than Occasional Baker. I had apples that never got around to being used (so rude of them ... how do you like them apples? 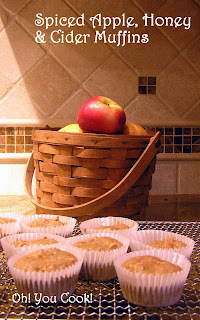 ), so I was thrilled to find that Ros (who also goes by the name of Baking Addict) had a nice stash of apple recipes. Although she did have an apple muffin recipe in stock, I made the executive decision to turn her Apple, Honey and Beer Cake into muffins. Because it uses no milk or eggs (you're welcome, vegan and lactose-intolerant Dear Readers). And to use up a bottle of sparkling cider I had in case of an emergency. Which, since I had no idea if the local wine store even had apple beer in stock and was not even sure if apple beer is inherently kosher or needs a hechsher (kosher certification), made this an emergency.